The is the first Swedish hardback edition of A Thief of Time published in 1989 by Bokforlaget Legenda AB in Stockholm, Sweden. 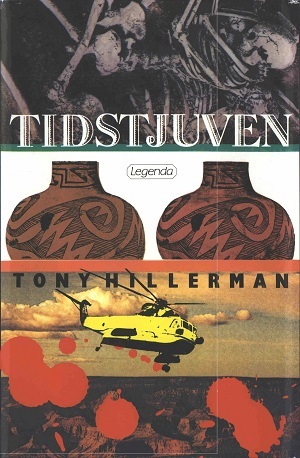 This edition was translated from Tony Hillerman's original text in English to Swedish by Karl G. and Lilian Fredriksson. This is the eighth Navajo Mystery novel by Tony Hillerman. The main characters Joe Leaphorn and Jim Chee join forces to investigate two missing items: a female anthropologist and excavation equipment. The cover design is by Claes Tobiason. The cover is a series of photographs: a burial in black and white, the repeated image of a Chacoan black-on-yellow style olla (ceramic vessel similar in style to those found in the archaeological sites within Chaco Culture National Historical Park), and a picture of a yellow helicopter flying over the Grand Canyon splattered with blood. Format: Hardback, 22 x 13.8 cm. Binding: Bright orange boards with the title printed vertically in green on the spine.